The CQC inspections: what are they for and how do they affect you? what documentation should be prepared for an inspection team visit. 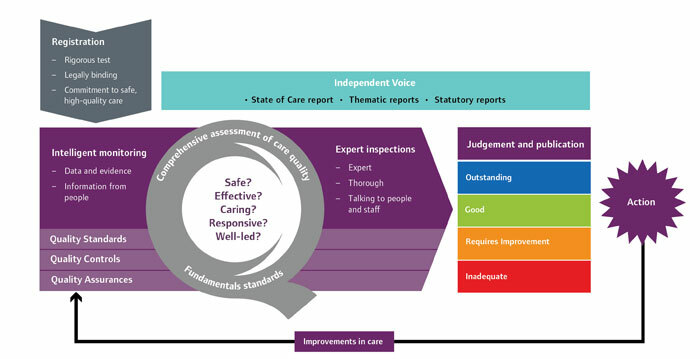 The Care Quality Commission (CQC) is the independent regulator of healthcare and adult social care in England.1 The organisation was established by the Health and Social Care Act 20082 to ensure that healthcare and social care services provide people with safe, effective, compassionate, high-quality care. In primary care, the CQC has the responsibility for regulating general practices, out-of-hours services, urgent care services, NHS 111, dental practices, prison medical services, and independent primary care doctors. The largest part of this work is the regulation of general practices, of which there are approximately 8000 in England. We plan to have inspected each of these practices at least once by April 2016. Why do we inspect general practice? We know that the majority of general practice is of good standard in England; however, we also have seen unwarranted variation in the quality of care delivered and know that some patients receive poor care.3 As the regulator, we have a statutory duty to ensure that patients receive high-quality care, and we are committed to being transparent with the public about where this variation is occurring. How do we inspect general practice? The CQC first started to regulate and inspect general practices in April 2013. The aim of these inspections was to assess compliance with the essential standards of care outlined in the Health and Social Care Act 2008.5 However, our commitment to celebrating excellence was not fulfilled with this compliance-focused approach, so we adopted a new methodology which we began piloting in April 2014. This was fully rolled out nationally on 1 October 2014. By asking these questions, we undertake a more holistic assessment of quality and can identify 'Good' and 'Outstanding' care. people experiencing poor mental health. Practices will be rated as 'Outstanding', 'Good', 'Requires Improvement', or 'Inadequate' for each of the five key questions and for each population group. Practices will also receive an aggregate overall rating. We publish ratings as we believe it is important to be open and transparent with the public about the quality of the services they use. These ratings should also encourage providers to improve the quality of services they offer and is the mechanism by which we can celebrate outstanding practice as well as identify areas of poor care. The process of regulating providers involves four key steps (see Box 1, below, and Figure 1 below). By publishing our findings, we can inform the public about the quality of the services they use and encourage providers to improve. Below is a summary of the key events before, during, and after our inspection process. You will be given 2 weeks' notice of your inspection date. Although you may already have read our Handbook,6 it is advisable to re-read it so that you refresh your memory as to how the inspection will be conducted and what key lines of enquiry the inspector will be pursuing. At this point, it would be advisable to prepare folders containing information the inspector will want to see; for example, clinical audits, staff recruitment and appraisal, and minutes of staff meetings. Between 1–2 weeks before the inspection day, the inspector will telephone the practice to introduce themselves and answer any questions the practice may have. The inspection team will arrive on the morning of the inspection and will comprise at least one inspector and one GP specialist advisor. Depending on the size of your practice, there may be a second inspector, or additional specialist advisors such as a practice manager or nurse, or 'expert by experience'. The day will start with a 30-minute presentation from the practice. This is an opportunity for staff to showcase particular strengths of the practice, and highlight any key challenges or important pieces of context. The inspection team will then begin holding interviews with members of staff (GPs, practice manager/s, nurses, healthcare assistants, and administrative staff) as well as patients. At lunchtime, the inspection team will meet to corroborate their early findings before continuing their discussions with patients and staff. The day ends with a brief feedback session between the inspector and the practice manager/GP principal. In rare circumstances, the inspector may need to return for a second day to collect further information. This may occur if the practice is very large, or if there was insufficient time to collect all the necessary information on the first day. In the days following the inspection, the inspector will collate all the evidence collected and draft the report. The report then goes through our Quality Assurance process of peer review by another inspector and an inspection manager. After this, our Regional (or National, if necessary) Quality Assurance Panel reviews the report to decide an overall rating. Before the report is published, the draft report is shared with the practice for a 'factual accuracy check' and the practice will have 10 days to raise any issues. This whole process from inspection day to publication typically takes 6–8 weeks. If a practice is not compliant with regulations, further follow-up visits may be required to ensure improvements are made. The timing of these visits will vary depending on the nature of the problems identified, but are typically weeks or months later. We understand that inspection can be a stressful time for practices. We try to make the process as easy as possible by providing information in our Handbook6 and Appendices,7 which outline our inspection process in detail, and by writing 'Mythbusters'8 about frequently-asked questions. These can be found on our website. The CQC will inspect all general practices in England at least once by April 2016. Care Quality Commission website. How we do our job. www.cqc.org.uk/content/who-we-are (accessed 12 January 2015). Health and Social Care Act 2008. www.legislation.gov.uk/ukpga/2008/14/contents (accessed 12 January 2015). Care Quality Commission website.Mythbusters and tips for GPs and out-of-hours services.www.cqc.org.uk/content/mythbusters-and-tips-gps-and-out-hours-services (accessed 12 January 2015).